3 bedrooms, 2 big main rooms, 2 large baths, private pool and garden. A 300 year old farmhouse with lots of charm, wooden beam ceilings, huge fireplace, piano, stereo, television and dvd (home cinema), unlimited internet and all basic appliances. Equipped to sleep 6 very comfortably. Can sleep 8. Tables, chairs, dishes, sofas, for 10 or more. Set in our 150 acre property surrounded by extensive woods, the Basse Cour has a large private garden and pool area. We are situated on the Loir river, near the famous chateaux of the Loire valley, a wonderful zoo, amazing trogledights, near fortified medieval town of Durtal and Bazouges with its 12C church, 25 minutes from the fun town of Angers, 2 hours from La Baule and equal distance from Saint Malo. 40 minutes to the LeMans racetrack. There are several local golf courses, including the beautiful Baugé Golf. Kayak and bicycle rentals are possible nearby and there is tree climbing, zip-lines, sailing and more to keep all age groups busy. We are happy to help you with general information and reservations you may need but can also just “stay out of your hair”. Whatever makes you holidays the best for you! I grew up in Los Angeles and arrived in france at the age of 21. Met my french husband and have been here ever since! After many years of being Parisien, Xavier and I haved moved permanently to our country home, Château de La Barbée. The 'Basse Cour' is one of the farms on our extensive property. It was our country home for many years until moving into the chateau. The house does not feel like a 'rental property' but a home full of warmth and charm. And it has all the modern necessities, comforts, appliances, and internet. Our extensive private property includes woods and river where you are free to wander and go fishing. A very beautiful (and tuned)grand piano, the cellar has lots of frogs, the water fountain makes a very zen 'trickle' sound, perfect for reading and relaxing,. The huge fireplace is wonderful if it gets chilly in the evening, big bathtubs for a relaxing hot bath, home cinema and many satellite channels and dvd's. And if you should have the desire to adventure beyond this slice of paradise, there are many cultural, historical, and culinary interests in our region, that I am happy to help you organise, if you wish. I also have cooking courses in the chateau that you are welcome to sign up for: www.lavieduchateau.com . Nice large bathrooms with WC's. No walk-in showers for handicapped but can supply special pivot chair to help get in and out of bath. We loved the rustic charm, peace and quiet, and history of this property. The owners couldn't be more helpful and allowed us to explore their extensive grounds at our leisure. An amazing holiday for all ages. We (including our two teenage daughters aged 14 and 17) had an amazing 2 week holiday experience at the farmhouse in August 2015. Mary and Xavia were perfect hosts, warm and friendly and on hand if we had any questions. We were encouraged to explore their extensive beautiful grounds. They even have their own chapel. The woods are lovely to walk around and at the rear end of the chateau is the Loire River which we had a swim in one day. If you stroll down the rose garden, cross one of the fairy tale bridges there is a beautiful orangery with a piano residing inside which can be played (our daughters play the piano so it was a magical experience). Izzy (their dog) is the friendliest dog we have ever met and she would often accompany us all on one of our walks and occasionally we would also see Juliette (their cat). The farmhouse was bigger than we expected from the photos and had everything we needed. It is tastefully decorated and clean. The main lounge has double doors which we would open early morning and gave us another lovely view not shown in the photos. The village Bazouges-sur-le-Loir is only a short drive away and la Fleche was the main town we visited for the supermarket. We visited Angers which has a New Orleans influence, Saumur initially to see the Troglodytes but we also went into the pretty town for lunch. Worth a visit. Paris is under 3 hours. We parked just outside of Paris at Chateau de Vincennes with no problems accessing the subway from here and no parking costs. I would recommend this property to all ages. We stayed in this beautiful farmhouse for 2 weeks and immediately wished we could have stayed longer. It's very green, peaceful, charming and private. Only a short drive (some only 5-10 minutes, some places 15-30) takes you to local markets, castles, a beach (small charming lake), vineyards, a zoo, botanical gardens and lots of other fun, interesting or practical places.. Our 2 young children loved the house, the garden, the pool, the fantastic surroundings and of course feeding the donkey and the horse carrots everyday. The house has all the basics you need, a beautiful fireplace and a true historic value & feel.. Mary & Xavier (The owners) are absolutely lovely, very flexible and helpful in every way. Au milieu d'arbres centenaires et entourée d'un somptueux jardin se dresse la merveilleuse "La basse cour" qui a gardé toute son authenticité, son charme et son caractère d'époque. Merci à Mary de son accueil et surtout d'avoir su préserver et de faire partager cet endroit exceptionnel. Tout est fait pour rendre le séjour agréable autour d'un barbecue dans le jardin, devant un feu de cheminée le soir ou dans la piscine la journée. Nous avons apprécié notre week-end; et nous gardons cette adresse pour y revenir. Maison de caractère, et très agréable. Mary est une personne très avenante. La Basse Cour is a magical place to have as a base for exploring the Loir Valley. As a complete opposite to previous experiences the property is a lot bigger and more impressive than the pictures in the advert would indicate. There seemed to be endless rooms for the children to explore and so much for them to do. 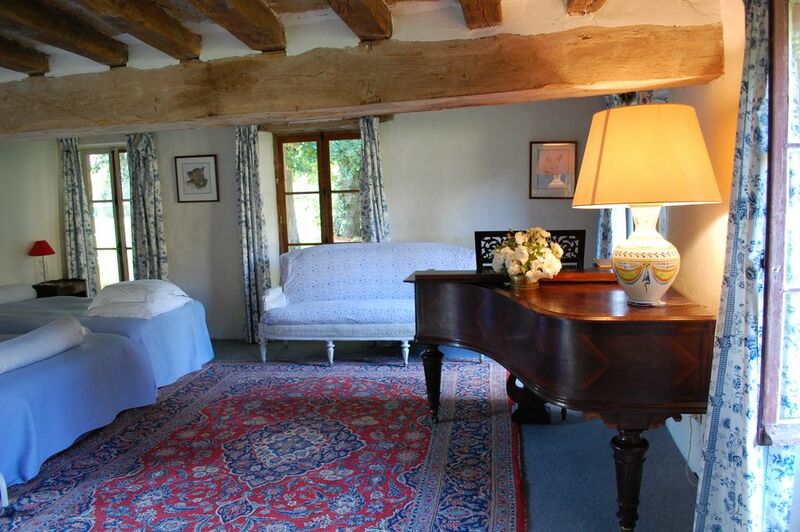 The house is set in the grounds of the owner's chateau and there is a real feeling of space and privacy. There is just under a 1000 acres of grounds and forest to explore should you wish! The property has a number of gardens and the pool was immaculate as the gardener inspected and treated the pool daily as required. There is an orangery and rose garden to look at in fact there is so much to do and look at without having to get into your car. The children who were 8 and 6 loved walking down the seemingly endless drive on their own to feed Hector the donkey. Mary the owner could not be more helpful and really helped to make our two weeks there memorable. The house has all mod cons and the master bedroom even has a grand piano and telescope in it! The house was spotless and cleaned throughout our stay. The property had real character and felt very homely. The area has so much to see, there seems to a chateau around every corner and there are great shops and restaurants near by. The zoo at La Fleche which is 15 minutes away was fantastic and the children said it was just like the one at La Palmyre. It is difficult to convey just how impressive the property is and the real character and charm of the house and the surrounding area. We would thoroughly recommend this property which would be suitable for both familyies and couples. David and Lynn, Thank you for your very nice review. I am very pleased as it is important to me that guests have an enjoyable time at the Basse Cour and keep good memories of their stay. Hope to see you again soon! Situated right on the Loir river near the famous chateaux of the Loire valley, nice restaurants, bike paths, the excellent golf course in Baugé and a wonderful zoo (La Fleche). 25 minutes from the fun town of Angers, 2 1/2 hours from Paris and equal distance from seaside : Saint Malo and La Baule. There is also conoe-ing, fishing, tree climbing, zip-lines, sailing, and many cultural and other activities for all ages in our region. Please note there is a mandatory 100 € linens and cleaning fee. This is a one time fee. It is on top of the rental fee and includes all house linens and beds are made up. I quote this separately because renters that stay more than 1 week only pay this 1x. Full payment is due 30 days prior to arrival date and 350€ security deposit and 100€ cleaning fee upon arrival. Cancellations: 30€ fee will be charged for cancellations more than 60 days prior to arrival. For cancellations 30-60 days prior to reservation dates a 25% fee will be charged and for cancellations less than 30 days prior to reservation dates, a 50% fee will be charged.